Among white evangelical Protestants (a traditionally Republican group), support for the GOP has grown from 65% in 2008 to 70% today. The GOP has also posted gains among Mormons, with 80% now saying they identify with or lean toward the Republican Party. 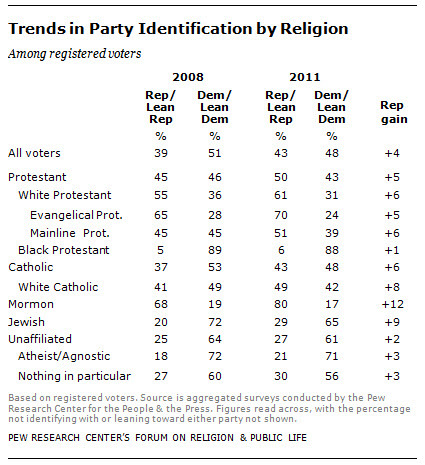 Republican gains are also apparent among white mainline Protestants (who were evenly divided between the parties in 2008 but who now favor the GOP by a 12-point margin) and white non-Hispanic Catholics (among whom an eight-point Democratic advantage in 2008 has become a seven-point Republican advantage at the end of 2011). Even Jewish voters, who have traditionally been and remain one of the strongest Democratic constituencies, have moved noticeably in the Republican direction; Jewish voters favored the Democrats by a 52-point margin in 2008 but now prefer the Democratic Party by a significantly smaller 36-point margin. There has been less change in the partisanship of black Protestants and the religiously unaffiliated, two other strongly Democratic groups. The analysis shows that across several religious groups, the move toward the GOP has been at least as large – if not more pronounced – among those under age 30 as among those 30 and older. White evangelicals under 30, for instance, are now more heavily Republican than those over 30 (82% vs. 69%); in 2008, by contrast, the partisan preferences of younger evangelicals closely matched those of evangelicals over age 30. 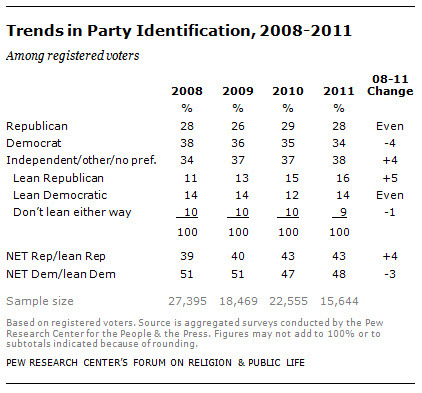 And among white non-Hispanic Catholics under age 30, support for the GOP has increased from 41% in 2008 to 54% in 2011.